The statue of Sims has stood in Central Park since 1934. 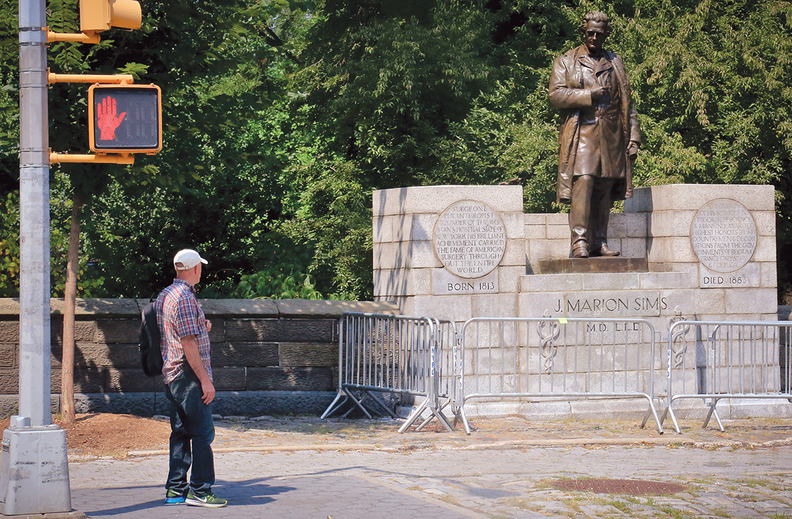 Critics want New York City to remove a statue in Central Park that honors a doctor who used slaves in developing a pioneering approach to treating physical problems women can develop after childbirth. The call to remove the statue of Dr. J. Marion Sims has gotten louder in the wake of violence during a recent white nationalist rally over the removal of a Confederate statue; the event sparked national discussions about what should be honored in a public square. Sims was a 19th century physician credited with developing a surgical technique to repair certain types of fistulas, or tears, which prior to that had been a seemingly insurmountable condition. He developed the technique through operations on enslaved black women in Alabama that were conducted without anesthesia. Among those calling for the statue to be removed is City Council Speaker Melissa Mark-Viverito, who at a recent news conference told the Associated Press, "We must send a definitive message that the despicable acts of J. Marion Sims are repugnant and reprehensible." White nationalists rallied in Charlottesville, Va., over the removal of a statue of Confederate Gen. Robert E. Lee. A counterdemonstrator was killed when a car was driven into a crowd protesting the rally. Following that violence, New York Mayor Bill de Blasio said a task force would review "symbols of hate" on city property with an eye toward determining whether removals are necessary.